4.25.2014 In March I was hellbent on learning ribbon embroidery. I bought books. I bought silk ribbon. I dug out my old embroidery hoops. On our roadtrip, I brought 8" squares of navy blue serge and a variety of ivory ribbons and threads. I can't practice embroidery in a sketchbook. I'm too unskilled. I actually have to use fabric and thread and needles to experience how they interact. I thought my simple white-on-indigo squares would form a kind of "practice journal." But alas, one very sad silk daisy was the only output, along with a few rows of sashiko straight (yokogushi) stitches. My other problem: the embroidery books I have emphasize the traditional little flowers and their projects all look too bland and dainty. Tea towel stuff. The 3-D silk flowers were definitely traditional but had the lusciousness I was looking for. 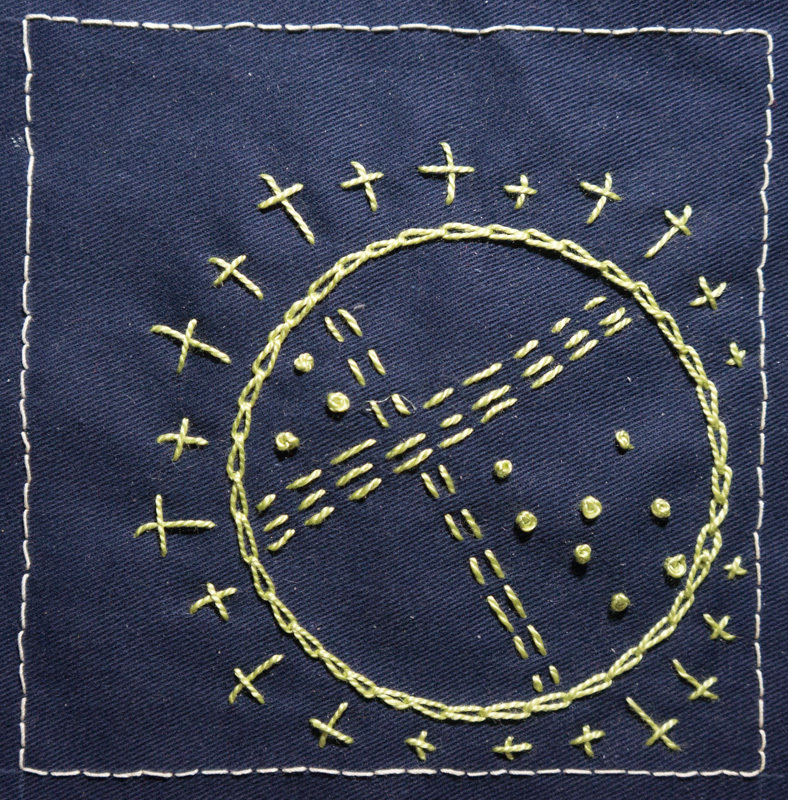 But, while any given stitch was not difficult, there was simply too wide a gap between my ambition and my skill. Home. Restless to learn. I signed up for a Craftsy course called "Stupendous Stitching." The instructor Carol Ann Waugh guides you through a project making use of machine couching, decorative machine stitching, hand embroidery, and simple machine quilting. 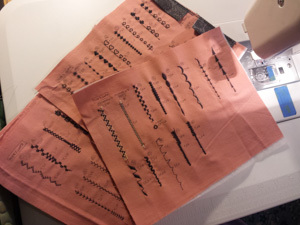 First step was to create a "stitch bible" -- samples of every stitch the sewing maching can make. Doing this in conjunction with the sewing machine manual taught me a lot about what my machine can do. As an added bonus, Carol was not stitching bland little pastel daisies but bold "folk-modern" designs. Yeah! Funny how that gave me permission to break out of the tea-towel mode of embroidery. 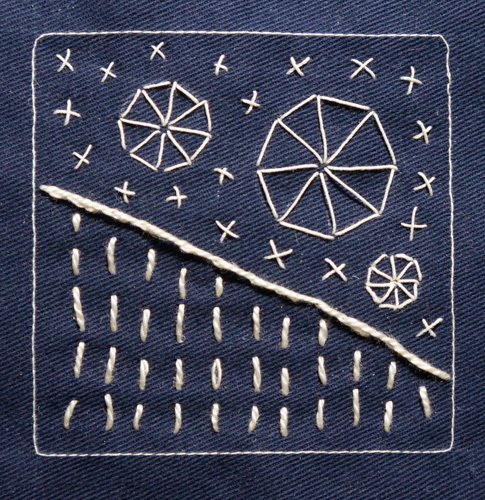 I also bought "Creative Stitching" by South African folk artist Sue Spargo. It's a small, spiral-bound reference manual, with color examples from her vibrant applique work... no daisies. The idea is to prepare 8" squares that will fit into a 7" embroidery hoop. Mark a 3" square in the middle and stitch around it by hand or (faster) on the sewing machine. Then play. #1 is at the top. (I got off on the wrong foot by doing a 5" working area instead of 3" but nevermind about that.) I practiced back stitch, running stitch, chain stitch, and French knot. Used perle cotton. I must say these are lots of fun to do. 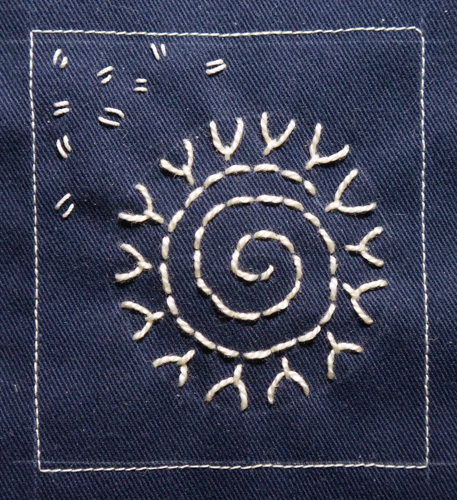 Doodle-stitching on a 3" square is perfect for an evening in front of the TV.